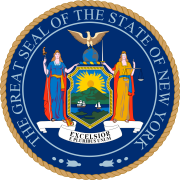 The 1936 New York state election was held on November 3, 1936, to elect the Governor, the Lieutenant Governor, the State Comptroller, the Attorney General, a judge of the New York Court of Appeals and two U.S. Representatives-at-large, as well as all members of the New York State Assembly and the New York State Senate. The Communist state convention met on June 14, and nominated Robert Minor for Governor; Julian S. Sawyer, of Buffalo, for Lieutenant Governor; and Irving Schwab, of New York City, for the Court of Appeals. The Socialist state convention met on June 27 at the Hotel Delano in New York City, and nominated Dr. Harry W. Laidler for Governor; the Rev. Herman J. Hahn for Lieutenant Governor; Edward Marks of Freeport for Attorney General; and Coleman B. Cheney for Comptroller. The Democratic state convention met on September 29 at Syracuse, New York, and re-nominated the incumbents Lehman, Bray, Tremaine and Bennett; and completed the ticket with Harlan W. Rippey for the Court of Appeals. The Republican state convention met on September 29 at Albany, New York, and nominated New York Supreme Court Justice William F. Bleakley, of Yonkers, for Governor on the first ballot (vote: Bleakley 680, George R. Fearon 348). Also nominated were Col. Ralph K. Robertson for Lieutenant Governor; John A. May for Comptroller; Nathan D. Perlman for Attorney General; and James P. Hill for the Court of Appeals. The American Labor Party filed on October 6 a petition to nominate only two candidates: Franklin D. Roosevelt for U.S. President and Herbert H. Lehman for Governor. The incumbents Lehman, Bray, Tremaine, Bennett, Merritt and O'Day were re-elected. Obs. : The vote for Governor is used to define ballot access.